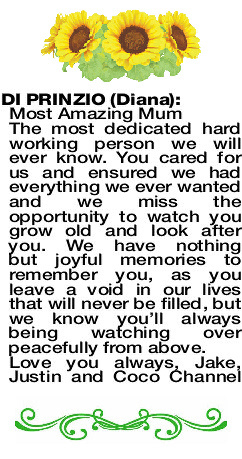 Passed away peacefully surrounded by her loving family 25.3.2019 aged 51. Devoted Mum to Jake and Justin. Much loved daughter of Roberto and Franca. Sister to David, Kevin and Tunya. Zia to Makayla, Zophia and Izak. Always loved and forever in our hearts. 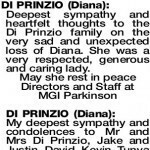 The Funeral Cortege for Ms Diana Di Prinzio of Morley will arrive at the main entrance of KARRAKATTA Cemetery, Railway Rd, Karrakatta at 9.30am on MONDAY (1.4.2019) for a Cremation Service. Vigil Prayers and Rosary will take place in St Denis' Church, 60 Osborne St, Joondanna on SUNDAY (31.3.2019) at 7.15pm. Donations to the Cancer Foundation in lieu of flowers would be appreciated. The most dedicated hard working person we will ever know. You cared for us and ensured we had everything we ever wanted and we miss the opportunity to watch you grow old and look after you. We have nothing but joyful memories to remember you, as you leave a void in our lives that will never be filled, but we know you'll always being watching over peacefully from above. There are no words we can write that will ever say how much we miss and love you. Our home is so dark without you. Our parting came so suddenly, we will always wonder why. The hardest part of all was we had to say goodbye. The tears in our eyes we can wipe away, but the ache in our hearts will always stay. Diana you hold a special place in our hearts until we meet again. 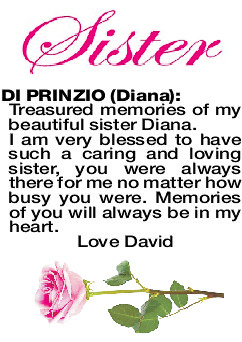 DI PRINZIO DIANA Treasured memories of my beautiful sister Diana. I am very blessed to have such a caring and loving sister, you were always there for me no matter how busy you were. Memories of you will always be in my heart. 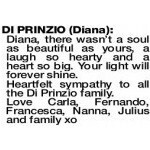 DI PRINZIO DIANA A Special piece of Sunshine in all our hearts, Warm, Bright and Happy our memories are. Your strength to fight for life, inspired us all. We know your gentle spirit will be with us always. 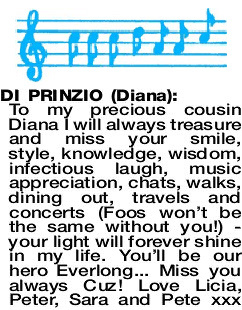 DI PRINZIO DIANA Farewell Diana. Your warmth and friendly personality touched us all. We will miss you and continue to ask why. 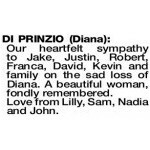 Love and strength to the Di Prinzio family. 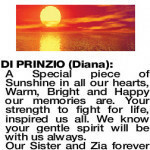 DI PRINZIO DIANA Fond memories of our beautiful cousin Diana. Sympathy to Jake, Justin, Robert, Franca, David, Kevin, Tunya and family. Heartfelt sympathy to Jake, Justin, Robert, Franca, David, Kevin and family on the sad loss of your dear Diana. Comari D'Accampo, Joe, Adriana, Nino and Family. 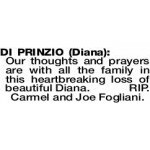 To Franca, Robert, Jake, Justin, David, Kevin, Tunya, Makayla, Zophia and Izak, we join all of you in your sorrow of dearest Diana. We wish you peace to bring comfort, courage to face the days ahead and loving memories to forever hold in your hearts. Wherever you are Diana, you will always be in our hearts and thoughts. 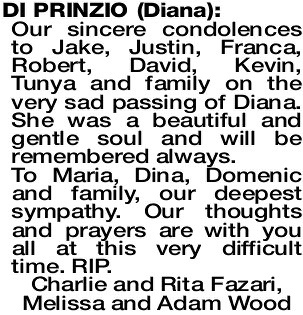 Our deepest sympathy to Franca, Robert, Jake, Justin, David, Kevin, Tunya and family on the sad passing of Diana. Will be sadly missed by Pina, Dino, Daniel, Mark, Adrian and families. DI PRINZIO DIANA Diana, there wasn't a soul as beautiful as yours, a laugh so hearty and a heart so big. Your light will forever shine. 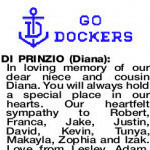 Heartfelt sympathy to all the Di Prinzio family. 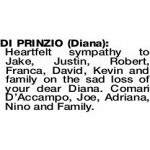 To Jake, Justin, Zia Franca, Uncle Robert, David, Kevin, Tunya, Makayla, Zophia and Izak, our deepest sympathy to you all on the sad loss of Diana. Such a kind, loving and caring person with a heart of gold. She greeted everyone with a warm smile that you couldn't forget. We will treasure the memories always and she will be dearly missed. Our prayers and thoughts are with you all at this sad time. Love from Zia Maria Di Prinzio, Domenic, Dina, Tony, Carla, Tina, Rob, Jacob and Aliyah. To dear Jake, Justin, Franca, Robert, David and Kevin, words cannot express our sorrow and sympathy for the loss of your beautiful and very courageous mother, daughter and sister. With love, Zia Giovina, Nino, Johanna, Mark, Nadia and families. 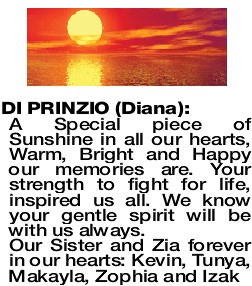 In loving memory of our dear niece and cousin Diana. You will always hold a special place in our hearts. Our heartfelt sympathy to Robert, Franca, Jake, Justin, David, Kevin, Tunya, Makayla, Zophia and Izak. Love from Lesley, Adam, Charmaine, Simon, Fiona, Chloe, Kira, Bella and Alex Di Prinzio. 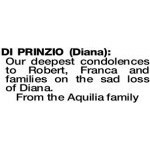 Sincere condolences to Robert, Franca and family on the passing of their beloved daughter and sister Diana. Heartfelt sympathy to Robert, Franca, Jake, Justin, David, Kevin and family on the sad loss of beloved Diana. 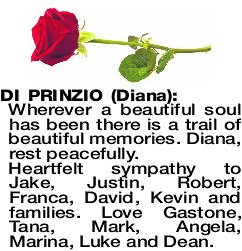 R I P.
DI PRINZIO DIANA Deepest and most heartfelt sympathy to Jake and Justin. 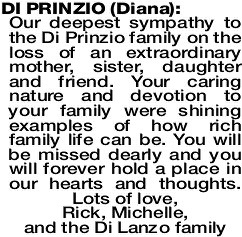 Mr and Mrs Di Prinzio and family and all those who loved her. May loving memories of Diana give you peace, comfort and strength. Our heartfelt sympathy to Jake, Justin, Robert, Franca, David, Kevin and family on the sad loss of Diana. A beautiful woman, fondly remembered. Love from Lilly, Sam, Nadia and John. 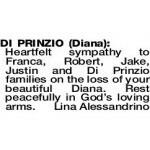 DI PRINZIO DIANA To Jake and Justin, my deepest sympathy on the loss of your Beautiful Mother. My Dear Friends Franca and Robert, my thoughts are with you always, especially at this devastating time. Diana was a lovely girl I will remember our girls trip to Singapore always. David, Kevin, Tunya and children, my Deepest Sympathy. 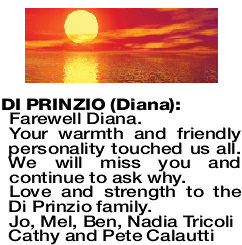 DI PRINZIO DIANA Saying goodbye to you our dear friend so loved, is harder than words can say. You will stay in our hearts forever. 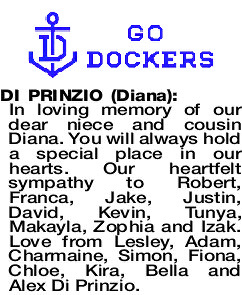 Deepest sympathy to Jake, Justin, Mr and Mrs Di Prinzio, David, Kevin and Tunya and family. Love you forever Diana. John, Celina, Alyssia, Jordana. 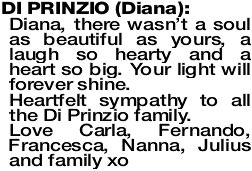 DI PRINZIO DIANA Deepest sympathy to Franca, Robert and family. From Pina Tosi and family. 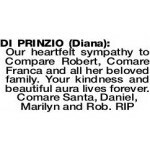 DI PRINZIO DIANA Sincere sympathy to Robert, Franca, David, Kevin, Tunya and all her loving family. RIP Diana. 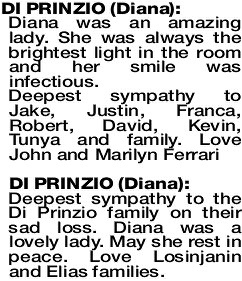 DI PRINZIO DIANA Heartfelt sympathy to Jake, Justin, Robert, Franca, David, Kevin and family on the sad loss of your beautiful Diana. 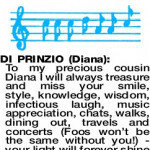 DI PRINZIO DIANA Diana was an amazing lady. She was always the brightest light in the room and her smile was infectious. 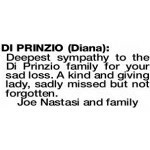 Deepest sympathy to the Di Prinzio family on their sad loss. Diana was a lovely lady. May she rest in peace. Love Losinjanin and Elias families. Deepest sympathy to the Di Prinzio family for your sad loss. A kind and giving lady, sadly missed but not forgotten. 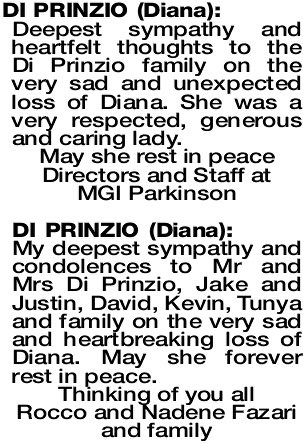 Our sincere condolences to Jake, Justin, Franca, Robert, David, Kevin, Tunya and family on the very sad passing of Diana. She was a beautiful and gentle soul and will be remembered always. To Maria, Dina, Domenic and family, our deepest sympathy. Our thoughts and prayers are with you all at this very difficult time. RIP. DI PRINZIO DIANA Diana - Luminous, Perfect - she was that and so much more. Our hearts are now broken and the world is a much sadder place for having lost her. Her star will burn brightly for eternity. Our thoughts and deepest sympathy to Jake, Justin and her family. Nada, Tony, Ashley, Rhys, Connor and Rachel. Our thoughts and prayers are with all the family in this heartbreaking loss of beautiful Diana. RIP. With deepest sympathy to Franca, Robert, Jack, Justin, David, Kevin and Family. From Anna and Mario Graziani and Family. Our deepest condolences to Robert, Franca and families on the sad loss of Diana. 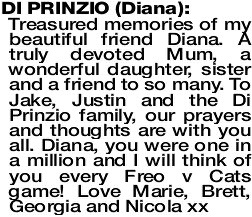 DI PRINZIO DIANA Love to Jake, Justin, Mr and Mrs Di Prinzio, David, Kevin, Tunya and family. Our thoughts and prayers are with all the family on the sad loss of your loved one. RIP Diana. Felice and Rita Tati and family. Diana, you have been taken too soon. Sympathy to Jake, Justin, Franca, Roberto and families in your sad loss. Wherever a beautiful soul has been there is a trail of beautiful memories. Diana, rest peacefully. Heartfelt sympathy to Jake, Justin, Robert, Franca, David, Kevin and families. Love Gastone, Tana, Mark, Angela, Marina, Luke and Dean. 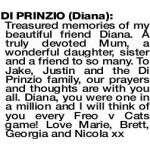 Deepest sympathy and heartfelt thoughts to the Di Prinzio family on the very sad and unexpected loss of Diana. She was a very respected, generous and caring lady. 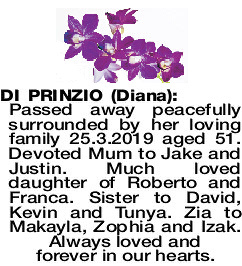 My deepest sympathy and condolences to Mr and Mrs Di Prinzio, Jake and Justin, David, Kevin, Tunya and family on the very sad and heartbreaking loss of Diana. May she forever rest in peace. 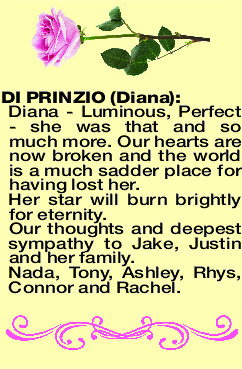 DI PRINZIO DIANA Our deepest sympathy and love to Franca, Robert, Jake, Justin, David, Kevin, Tanya, Makayla, Zophia and Izak. Diana, we will miss your love of life and sense of adventure, we will forever cherish wonderful family moments together. Dawn, Andrew, Angela, Ryan and Caragh.